frankly my dear...: Family, sun & lots of fun! I'm a bit late with this post, i have been very busy at work (stocktake.....blah) & trying to keep up with all the usual household mayhem. On the weekend my parents hosted a family reunion at their place, i had been looking forward to this for months & months..........the weekend finally arrived & the Victorian weather was extremely kind to us. My mum is one of eight - her parents immigrated from Italy in the 1950's with five children & then had three more in Australia. These eight children gave them 21 grandchildren, me being one of them. Our grandparents lived in a beautiful old house & my family was so lucky to live next door to them! 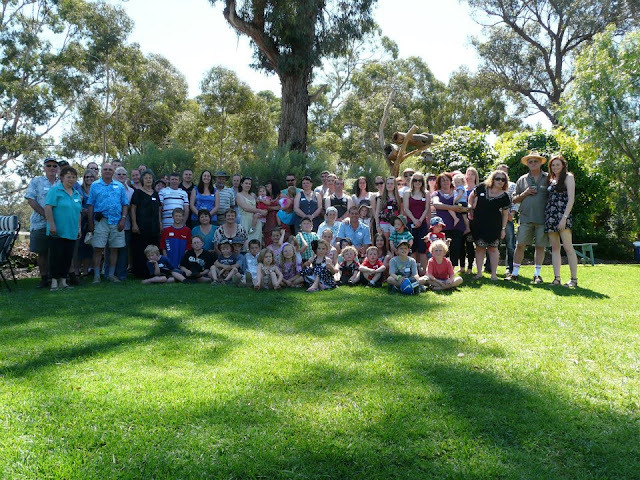 I have wonderful memories of growing up in this big family, our Christmases & family get-togethers were always so much fun. This isn't quite all of us, from my calculations, there are fifteen members missing who couldn't make it, but how's this for a branch of the family tree?! It was a wonderful weekend & i had a fantastic time catching up with cousins & i'm already looking forward to the next one.